Removal ProcedureRemove the camshaft timing chain, sprocket, and tensioner. 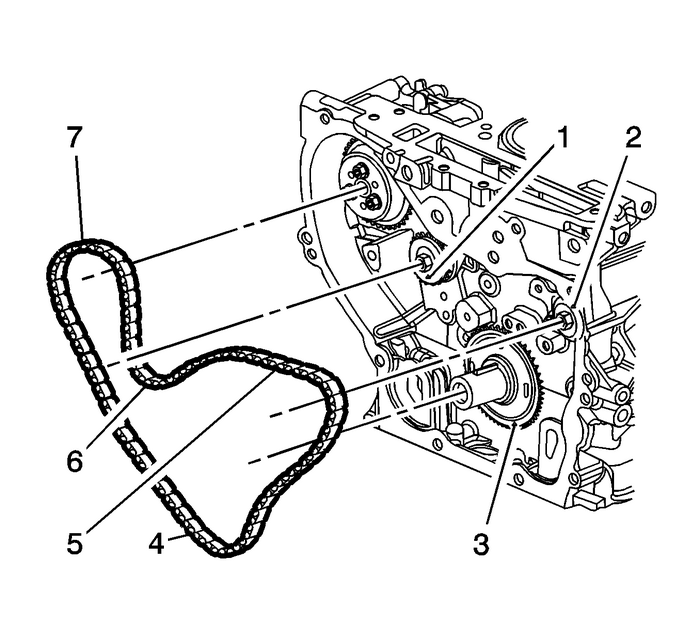 Refer toCamshaft Timing Chain, Sprocket, and Tensioner Replacement. Remove the small balance shaft drive chain guide bolts and guide. Remove the upper balance shaft drive chain guide bolts and guide. 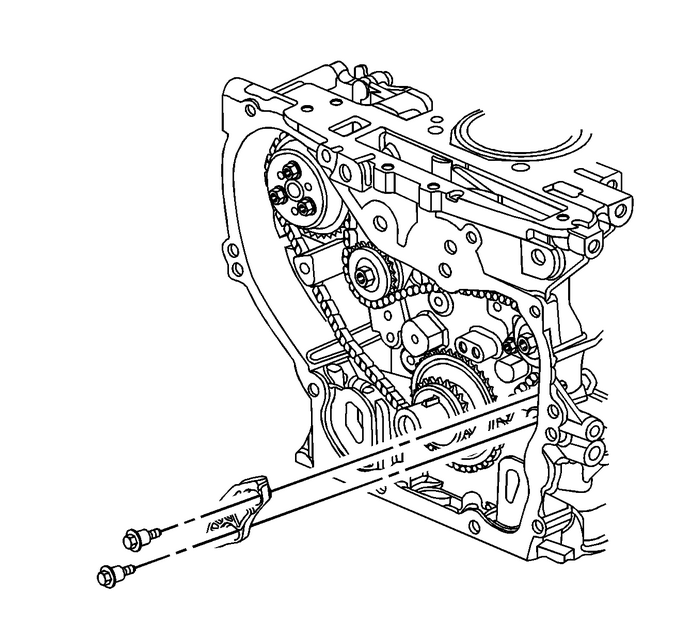 Note:It may ease removal of the balance shaft drive chain to get all the slack in thechain between the crankshaft and water pump sprockets. Note:There are two possible chain configurations for the engine. 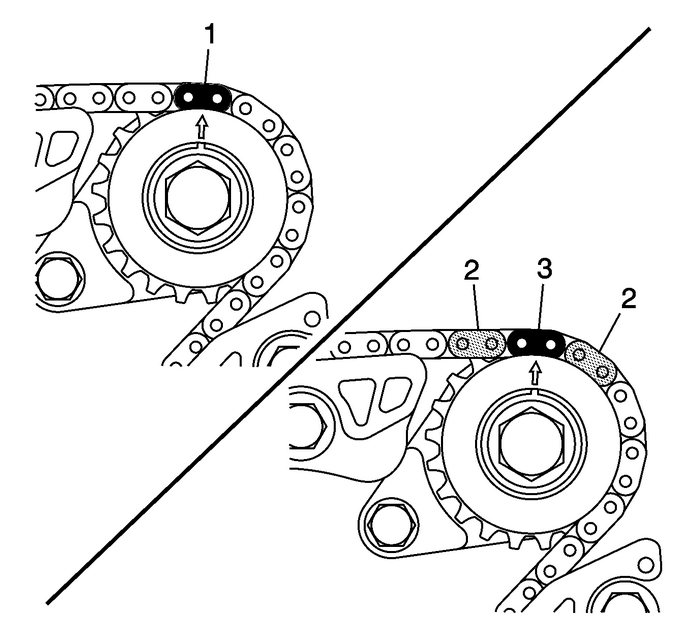 Both configurations usea unique chain link to line up with the intake side balance shaft sprocket timingmark. The first design uses a unique link color-(1). The second design uses a blackanodized link-(3) with uniquely colored links on either side-(2). Determine the configuration of the balance chain. Install the balance shaft drive sprocket.For the 1st design balance chain, install the balance shaft drive chain with the coloredlinks lined up with the marks on the balance shaft drive sprockets and the crankshaftsprocket. There are three colored links on the chain. Two links are of matching colors,and one link is of a unique color. 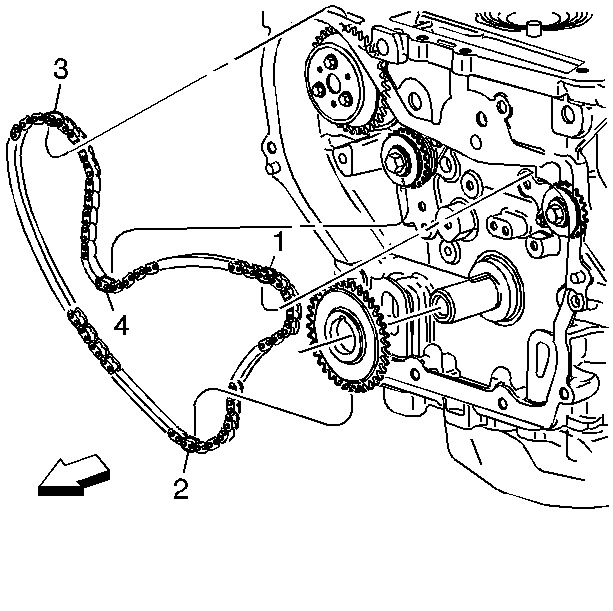 Use the following procedure to line up the linkswith the sprockets:Orient the chain so that the colored links are visible.Place the uniquely colored link-(1) so that it lines up with the timing mark on theintake side balance shaft sprocket.Working clockwise around the chain, place the first matching colored link-(2) in linewith the timing mark on the crankshaft drive sprocket, approximately 6-o'clock positionon the crank sprocket.Place the chain-(3) on the water pump drive sprocket. The alignment is not critical.Align the last matching colored link-(4) with the timing mark on the exhaust sidebalance shaft drive sprocket.For the 2nd design balance chain, install the balance shaft drive chain with the blackanodized links lined up with the marks on the balance shaft drive sprockets and thecrankshaft sprocket. There are three timing links with a black anodized finish onthe chain. One black anodized link has uniquely colored links on either side. Usethe following procedure to line up the links with the sprockets:Orient the chain so that the colored links are visible.Place the black anodized link-(1), with uniquely colored links on either side, sothat it lines up with the timing mark on the intake side balance shaft sprocket.Working clockwise around the chain, place the next black anodized link-(2) in linewith the timing mark on the crankshaft drive sprocket, approximately 6-o'clock positionon the crank sprocket.Place the chain-(3) on the water pump drive sprocket. The alignment is not critical.Align the last black anodized link-(4) with the timing mark on the exhaust side balanceshaft drive sprocket. 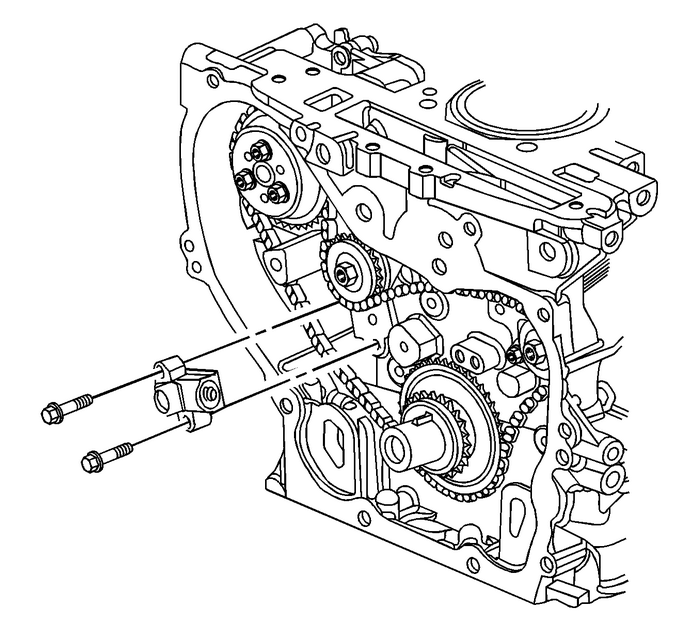 Install the upper balance shaft drive chain guide and bolts and tighten to 12-Y (106-lb-in). Install the small balance shaft drive chain guide and bolts and tighten to 12-Y (106-lb-in). Install the adjustable balance shaft chain guide and bolt and tighten to 10-Y (89-lb-in). 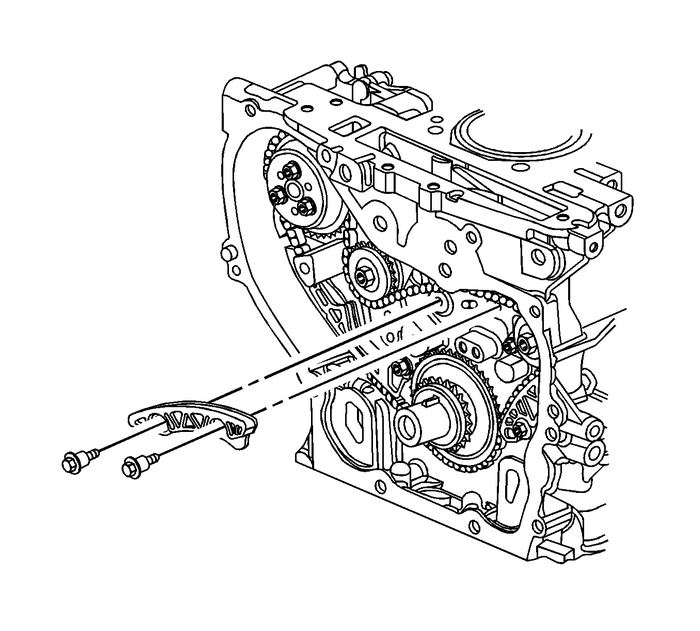 Reset the timing chain tensioner by performing the following steps:Rotate the tensioner plunger 90 degrees in its bore and compress the plunger.Rotate the tensioner back to the original 12 o'clock position and insert a paper clipthrough the hole in the plunger body and into the hole in the tensioner plunger.Install the balance shaft drive chain tensioner and bolts and tighten to 10 N•m (89lb in).Remove the paper clip from the balance shaft drive chain tensioner.Install the camshaft timing chain, sprocket, and tensioner. 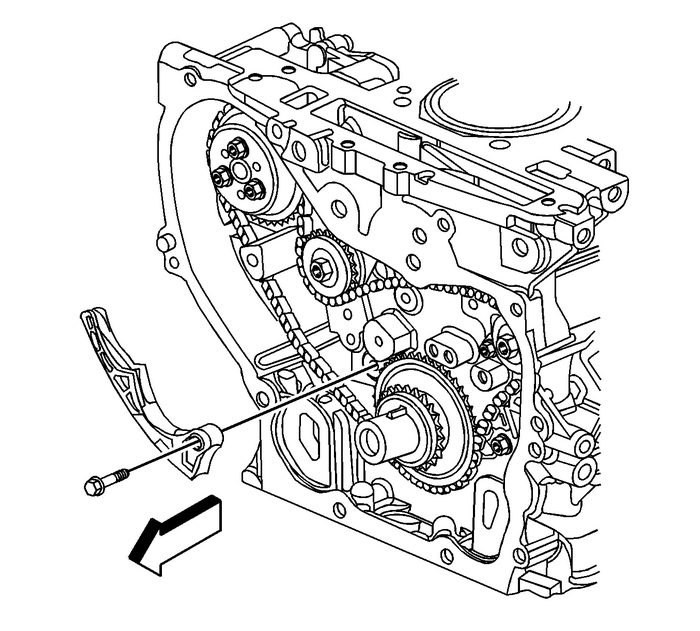 Refer toCamshaft Timing Chain, Sprocket, and Tensioner Replacement.